Six weeks ago I called fear’s bluff. 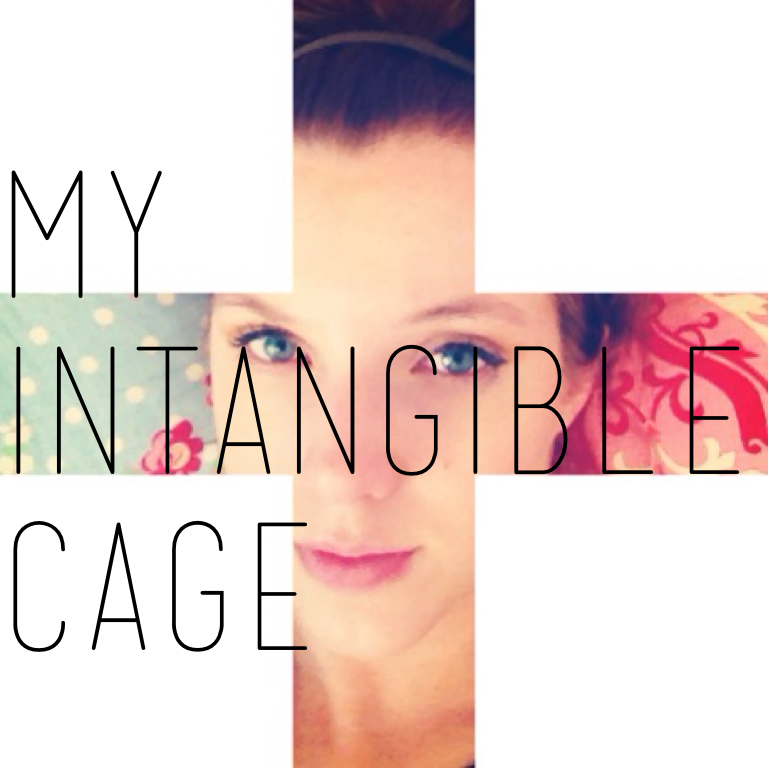 It has been six weeks since I started My Intangible Cage series. I had discovered that I lived in a cage of fear that was choking the life out of me and keeping me from living the life God intended. I unpacked the lie that fear is responsible. I chose to run instead of hide. I talked about my shame regarding who I am and the fear of failure that so often holds me back. Thanks Chris Brown for that one. A truly beautiful thing happened. You started to come out of your cages with me. To say that I have been moved by your stories over this series would be an understatement. People dealing with fear of getting cancer, shame regarding their personalities, and others shut down by personal tragedies… to name a few. But, you are peeking out of your cages realizing that isn’t what you were made for. I’ve been inspired by your courage and resolve. Fear couldn’t keep us down or box us in. It tried. Fear lied , manipulated and tricked us. Fear made a strong case for all the ways our cages are good. It said the bars weren’t to keep us in, but to keep all the scary things “out there” far away from us. In our cages we were untouchable and safe… or so we were led to believe. Fear spoke to us in the quite moments of night before we fell asleep and in the early shadows of morning. Fear told us we are not and we cannot. But, God interrupted and told us something entirely different. Fear told me to keep my eyes down, it is about to get ugly. God told me to look up. The best is yet to come. Fear told me that I am not enough and I will never be enough. God told me that I don’t have to be enough because ‘ I AM ‘ covers all my lack. Fear handed me pounds of worry to weigh me down. Anxiety and stress regarding all of the “what ifs”. God told me to cast my cares on Him…and He will give me rest. I have learned that an amazing thing happens when I walk out of my cage. I begin to feel life flowing through my veins again. Dreams swirl and expectation rise. A deep sensation swells within my belly and works its way up. Soon, I hear a whisper of truth come from my lips. It is faint at first. A declaration of hope and future. Soon the whisper turns into a roar that my once timid lips cannot hold back. When we are free, we offer the world a manifesto of hope and freedom that we never even knew was within us. We become ourselves again outside of our cage. So, here is to courage friends. A life lived full of faith and destiny. Fear did not defeat us. It no longer owns us. Fear we have a destiny, and you will not keep us from it. We are free. There is nothing left to wait for because our Deliverance has come and He remains. The series is over, but the journey isn’t. It’s time to stand on your cage and say something. That thing that has been in your heart to say all along. The unique expression of God in you that is coming to the surface. Go ahead. 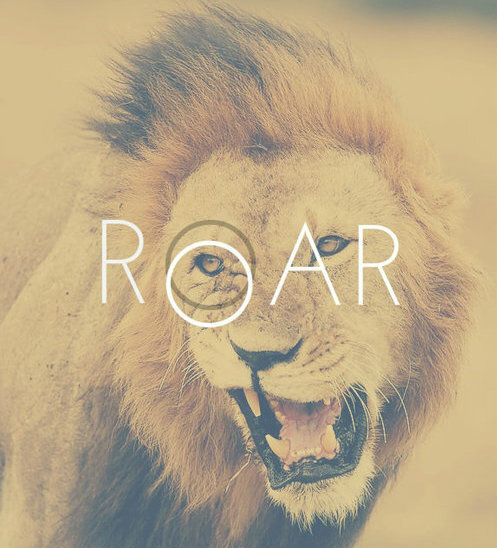 What will you ROAR??? To say that I’ve had some big failures in my life is an understatement. I knew that I couldn’t do a series about fear without discussing that. My Intangible Cage started 4 weeks ago and will finish next week. It has been a time of talking about the fears that hold us back from who we were made to be. Believe me, I have quite a few of those fears. Just about a year ago when my blog was starting to see some significant growth, I did something stupid. Really stupid. I wrote a post that was very personal and perhaps a bit controversial. I got a comment from an “anonymous” reader. It was bashing my point of view and accusing me of being arrogant. ( It has been deleted, so no need to scour the archives to see it) At least, that is what I thought it was. In all my wisdom I tweeted ” Got my first hater on the blog today”. Right. So, turns out that “anonymous” was not so anonymous. It was a friend whom I had known from childhood. Who follows followed me on social media. My stomach sank as I read her email. She let me know that her comment was simply a different opinion and since when did I get so arrogant to publicly mock someone for attempting civil discourse? She had changed to a different faith around college and I was pretty much her only tie to her Christian past. But now she wanted to cut ties completely. She blocked my calls, emails and de-friended me on social media. She hasn’t talked to me since. Fail. Epic, sweeping, keep me up at night failure. It made me seriously consider stopping blogging all together. I could not get over how immature I had been. I should not be trusted with a blog. But, I learned something about fear & failure from an unlikely source. Please stop cringing. I know that Chris Brown is not the standard go-to example for things. Remember when he was arrested for beating Rihanna in 2009? I can think of few things that are bigger failures. To not simply disappoint people, but commit a terrible act. Maybe one of the worst in my opinion. The news was ruthless and the public slammed him. Which, you know, he deserved. If I were him, I would have moved to some obscure village in the Himalayas and tweeted continual apologies. But, he didn’t retreat to a rural mountain village. 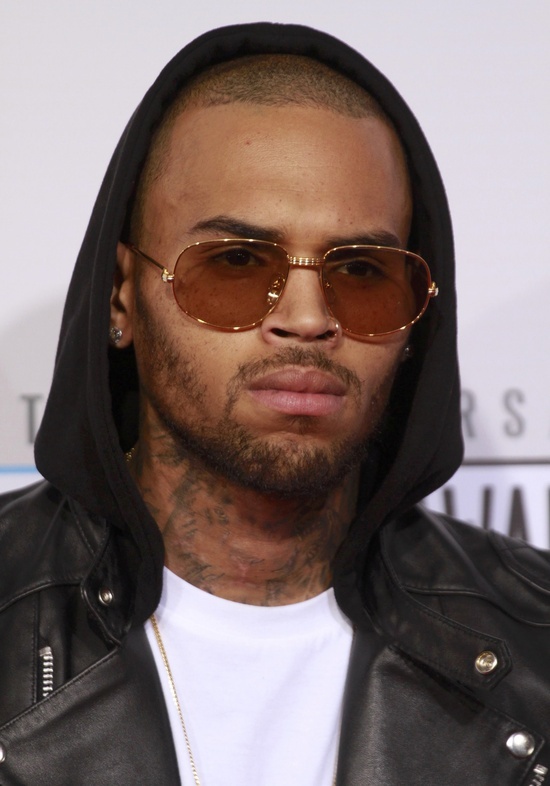 Chris Brown apologized, got help and then came back. Back on the red carpet, back in the news, back onto the music scene & even got back together with Rihanna. I’m sure you have an opinion on their whole dating situation, but I’d prefer you tell Perez Hilton and not me. The point is that he didn’t stay down. Everyone knew he did something terrible. Chris Brown failed. Not just failed but was flat-out awful. He was mocked. He was guilty. I am not excusing what he did & I genuinely hope that he has changed. Like him or not, he came back. Hate me for saying it, but I admire his courage. 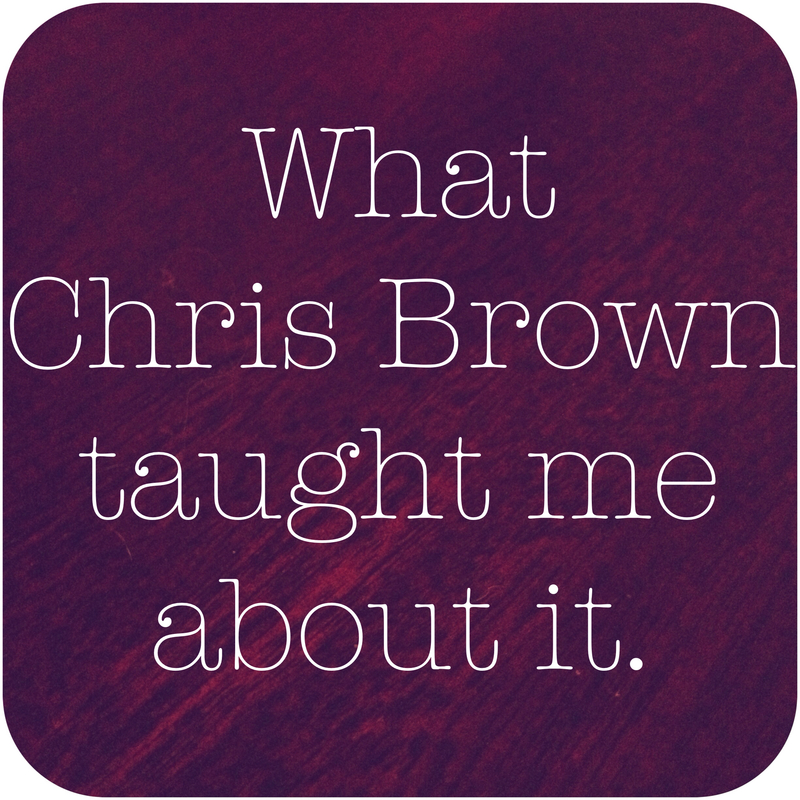 Chris Brown showed me that just because I failed doesn’t mean I have to remain a failure. There are days where I totally hate what I do. Embarrassment crashes down and I chastise myself with unforgiving thoughts. A self-inflicted punishment sends me back into my intangible cage. I don’t deserve to be let out. I will only mess up and be humiliated again. That is the thinking of someone with no Savior. And that isn’t me. I have a Savior. One who isn’t intimidated by my brokeness and my sin. Failure no longer remains a fear. No need to keep my head down when I don’t measure up. The days I say and do stupid things do not have to define me. My lack does not dictate my future. Your lack does not dictate your future. God is bigger. He covers us, forgives us, and makes all things new. We will fail but we will not remain failures. Our lack & weakness will be overrun by endless Grace & Mercy. It is week 5 of our series. The week we stop exiling ourselves to our cages. The week we stop glaring at our shame and look our Savior in the eyes instead. Hello courage to risk & try again. 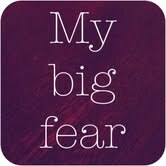 Welcome to week 4 of my series on fear. I had no idea when I started My Intangible Cage series a few weeks ago all the fearful things that would be going on these past few weeks. North Korea threatening nuclear war, numerous shootings, and discovering that the mother of a girl in my daughter’s kindergarten class has cancer. Then yesterday there were bombings at the Boston Marathon. What do you do with that kind of news? Most of my day yesterday was spent thinking about the situation in Boston. One of my good friends ran the marathon last year and several others were there watching this year. I was preparing dinner and struggling with a heavy heart. The news was reporting stories of marathoners who finished the race and ran to the hospital to give blood. Other doctors were sharing about amputating the legs of runners who were still wearing their numbers from the marathon. And then the news of the 8 year old boy who died waiting for his dad to cross the finish line. I choked back the tears, but not tears of fearful distress. Tears of determination. A determination that I won’t be shut down & humanity will not live in defeat. We will be sad and we will grieve, but we will not live in fear. I’m not sure why I felt the urge so strongly, but I felt the need to run. I am NOT a runner, but I tossed dinner in the oven and went to the back yard where my kids were playing. 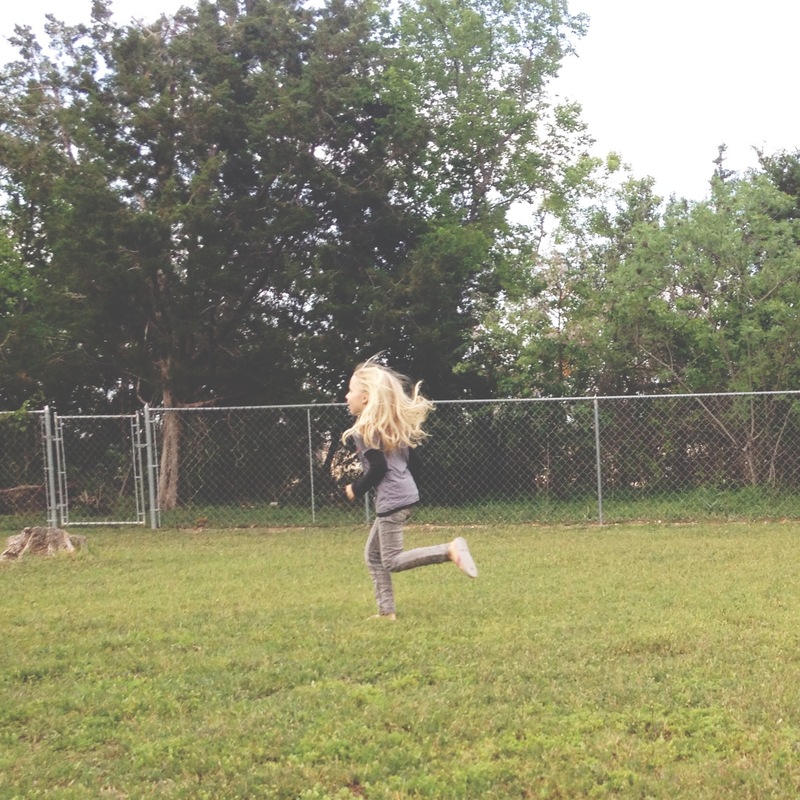 As silly as it sounds, I began to run around the yard. Perhaps it was an act of solidarity & a way to honor those who had been victimized during the race earlier. I am not sure why, but I just ran. And ran. And ran. My kids asked why I was running like a mad woman. I told them I am running because I am alive and I can. Soon we were all three running through the backyard. I ran for the people of North Korea who live under a oppresive government and can not move freely as I can. I ran for the mother of Sophie’s classmate who can not run with her kids in the backyard because she is recovering from a brain surgery to attempt to remove her cancer. I ran for the victims of the Boston marathon bombings. I want to embrace the gifts I have been given and stop fearing what could be taken. These are not days to spend sulking in our intangible cages and living within bars that are shadows of limitaions. We cannot believe the lie that our confinement keeps us safe. We can not believe that fear is the responsible response. Fear is never safe. These aren’t days to remain paralyzed by fear. These are days to run. 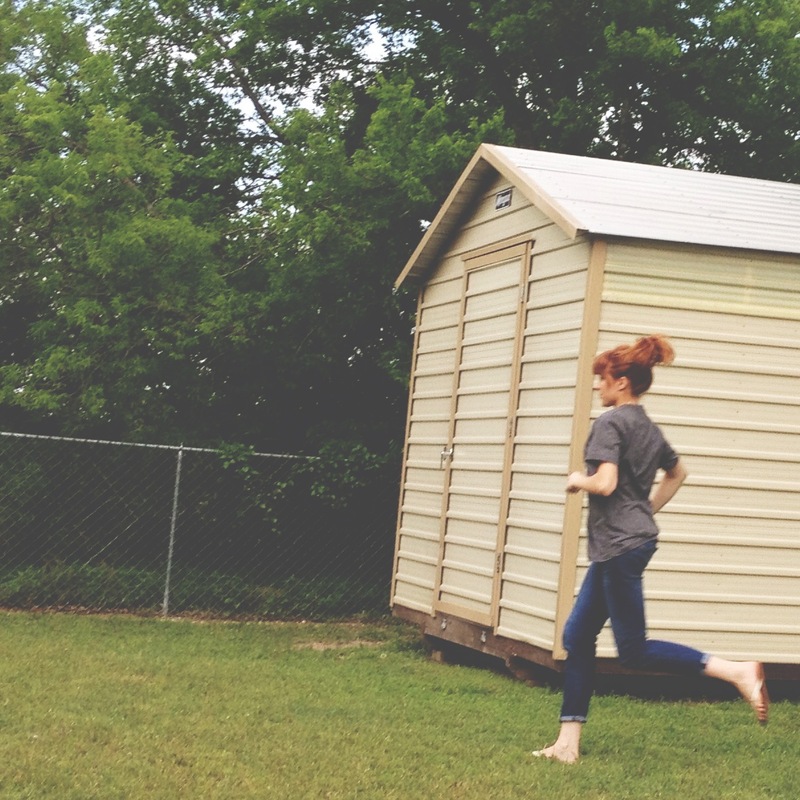 Run the races that God has marked out for us. Run because life is worth living. Run and have fun taking new ground. Run with determination that we will not be held back. Run with hope that what we are chasing is better than what we are leaving. Run because you are alive and able. Why do you run? Welcome back to My Intangible Cage series. I really can’t tell you how much I love hearing your feedback from last week’s post. We are on week 3 of this fear series. And today I’m gonna get real vulnerable. Ray LaMontagne is in the background ( well not him, but his music) and that always helps. This whole series has actually been vulnerable, but this particular fear is especially embarrassing for me. It is a fear I have dealt with almost all my adult life. 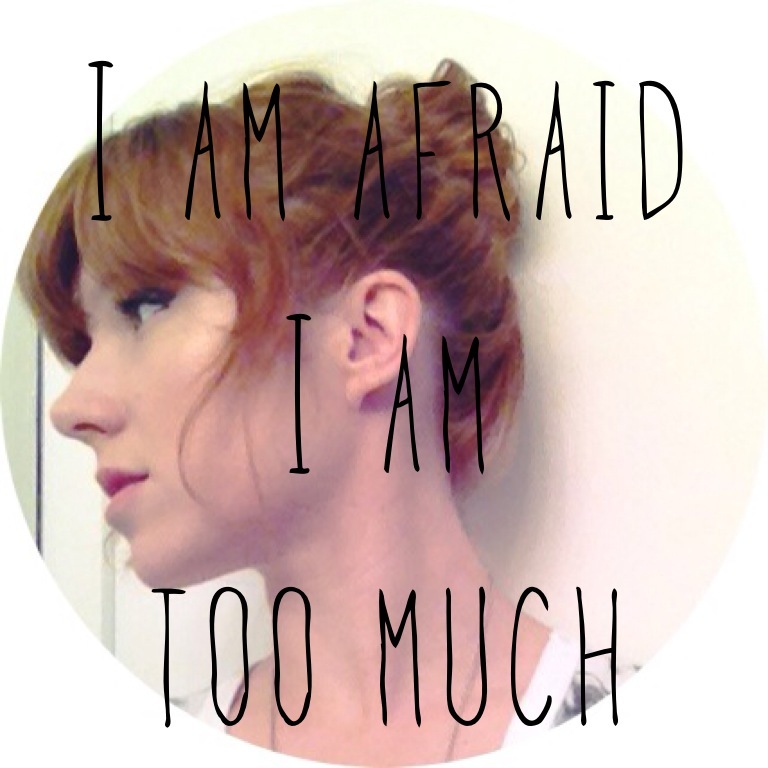 I am afraid of being too much & not enough. I am afraid I am too much to handle. I am afraid I am overbearing and my laugh may be annoying. I am afraid I will talk too much or make a joke at the wrong time. I am afraid my issues will be too heavy or my friends will get tired of my problems. What if people grow weary of dealing with my insecurities? I am afraid that my ambitions will be too big and my personality overwhelming. Sometimes I get off the phone and cringe at how strong I came across. What if people smile and are nice, but are secretly relieved when I walk away? I wish that I could be cute & sweet. But I’m not very good at that. I always end up being intense. I am afraid that people will get tired of me. 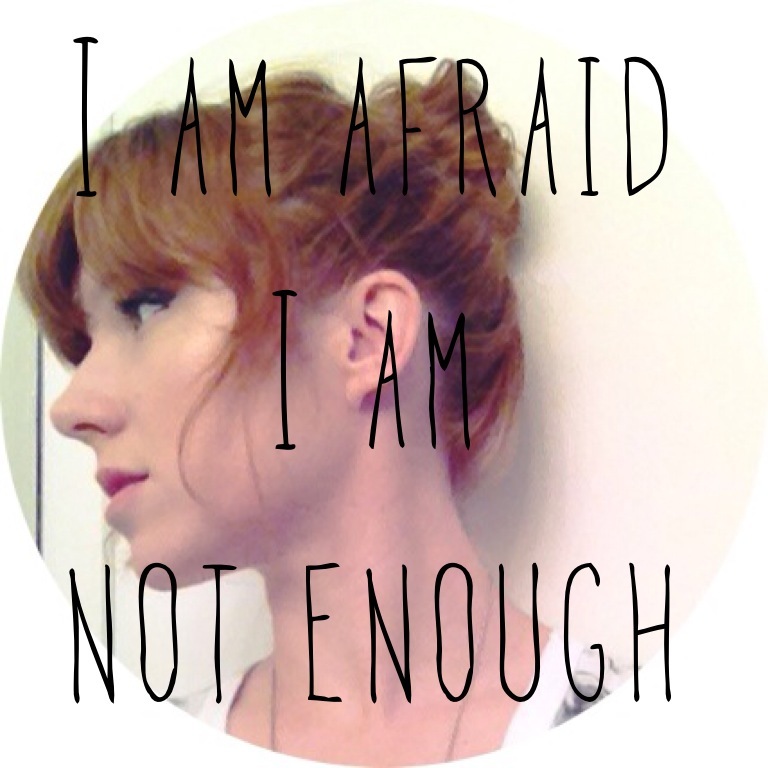 I am afraid that I am not enough. I am afraid that I will disappoint people or be a dud. What if people expect something amazing and I don’t deliver? What if I am the wallflower at the party and get written off as boring? What if I have nothing to add to a conversation & offer no value to an idea? Sometimes I leave a meeting thinking through the things I wish I had said but was too scared to. I am afraid that I will be underwhelming. The girl everyone likes but no one needs. I am afraid that there is nothing significant or memorable about me. And so, I binge back & forth between “too much” and “not enough”. When I feel overwhelming, I gear down. Soon I am afraid I have backed off too much. Time to jump back in the game. I evaluate my environment to see where I am on the pendulum. 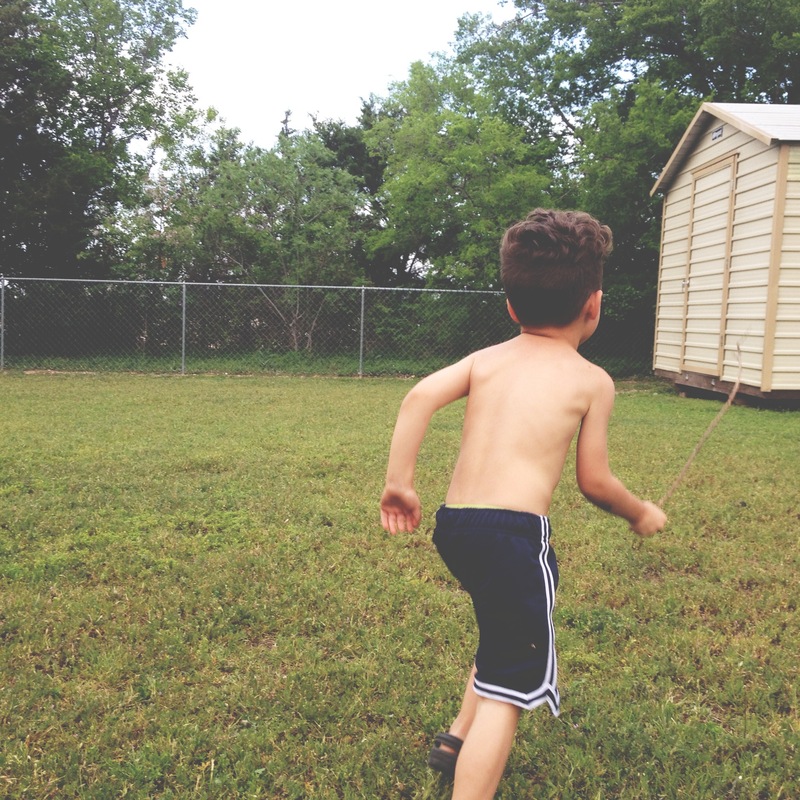 I am constantly battling this tension…back & forth I go. Overcompensating for my percieved “too muchness” or “not enoughness”. Can’t come across too strong or too weak…because I am afraid of who I am. The truth is I will never get it just right. Because I am not supposed to. I have flaws. Sometimes I am too much for some people and sometimes I am not enough for others. But so what? Fear robs me of truly sharing my life with others. My friends & family do want to walk with me even through my “too much” days. And they never look at me and see “not enough”. Your friends & family don’t either. 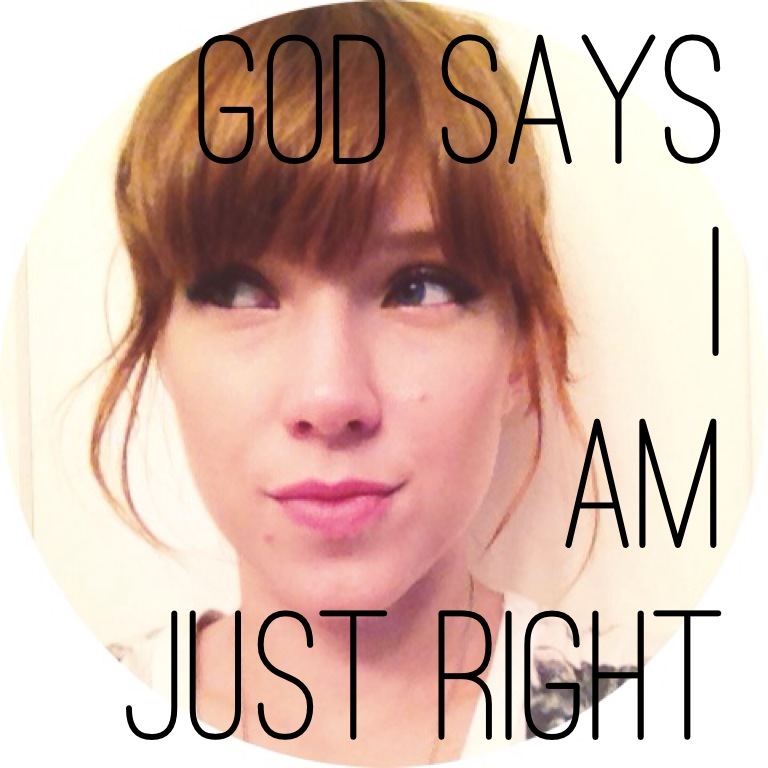 Most importantly, God says we are just right. We are fearfully & wonderfully made. Designed with a specific purpose and a divine composition to accomplish that purpose. He isn’t annoyed with our dreams, hopes, insecurities and weaknesses. It is time to stop being afraid of who we are & who we are not. I’m going to try to embrace who I am and stop worrying about being intimidating. It is time to silence the voices & lies that accuse us of being “too much” and “not enough”. Time to be bold in the way we accept ourselves. Are you in??? We won’t be perfect, but we will be honest. God can handle us. He can handle all of us. Welcome back to my Intangible Cage series. Every Tuesday for six weeks I am sharing things I am learning about getting rid of fear and anxiety. I must say, I was overwhelmed with your feedback. Seems like I am not the only one who deals with fear. Welcome to the journey peeps. I mentioned it last week, but we all have issues that hold us down and leave us immobilized. That issue is fear for me. Fear is tricky because sometimes it looks like the responsible thing to do. Daughter has a cough? The responsible fearful thing to do is research every terrible disease that it could be a symptom of and then play those scenarios out. Forget resting and staying hydrated. This could require hospitalization. I need to know the symptoms of lung cancer right? Husband is away on a trip? The responsible fearful thing to do is think about what would happen if his plane crashed. That isn’t the kind of thing you want to be caught off guard on. I should decide now what I would do if that situation were to occur. What would I do for a job? I need to make sure our finances are in order. Oh, and I need to freak out about the thought of becoming a single parent. Have a dream in your heart? The responsible fearful thing to do is pick the idea apart. What could possibly go wrong? How bad would failure hurt? Is this too embarrassing to pursue? What is the ideal situation and lets wait for that to come to pass. Which will never happen. My list could go on and on. Seriously, it could. I could write it off as my personality or my wanting to be prepared. However, I don’t work for FEMA and therefore do not need to have every scenario lined out. This “responsible” attitude keeps my wheels spinning and makes me stressed. I use all my emotional energy living out possibilities in my mind. I internalize my panic. When my friend calls she will get a girl who has shut down. She won’t know that my child got lung cancer, I became a widow and my dreams died all in a single day. Because they didn’t. None of those things actually happened, but if feels like they did. It is too embarrassing to tell someone I imagined all these tragedies and so I act as if I am not emotionally exhausted. Which is even more tiring. My “responsible” life is draining the energy to use in my actual life. The energy I could use to play with my daughter who has a mild cold, talk to my husband who called to tell me his plane landed early, and chat with my friend about my latest dreams. Fear isn’t responsible. We call it all kinds of noble things to mask our worry and anxiety. Life will have some really hard days. So, why ruin the good ones? I don’t want to lie to myself that my fear is noble or some sort of higher road. It isn’t. It steals from me. Just another reason this intangible cage has got to go. Does your fear ever seem responsible to you? I’d love to know. Keep the emails, tweets and comments coming. Here’s to another week venturing further outside of our cages!